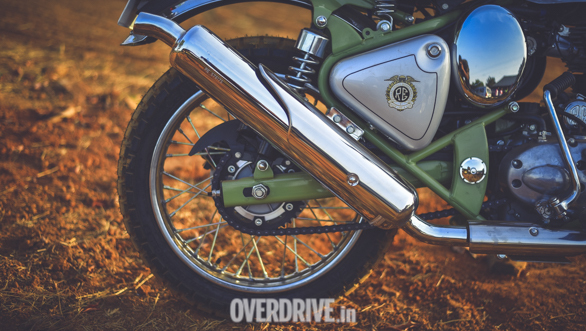 The Royal Enfield Bullet/ Classic series of motorcycles is their bestselling model line in India and that's because, despite being around for a few years, their desirability hasn't waned. Also, if you've seen the sheer number of these motorcycles in and around Ladakh, it'll give you a fair idea of how tough they are when it comes to tackling difficult terrain and harsh weather conditions. That very platform has spawned a new genre of motorcycles that's set to introduce Royal Enfielders as well as people new to the brand, to a different kind of riding experience. They're called the Bullet Trials 350 and the Bullet Trials 500. Wondering what does Trials mean? Trials is a type of competition that has been going on for decades. It involves a rider on a motorcycle, riding across a natural trail, mainly without putting his foot down. Now, it's the natural bit in the above sentence that you should pay attention to because it means riding over rocks and on loose mud or gravel. Riders have to set a competitive time and points were deducted in case the rider places his foot on the ground. It is a test of rider skill as well as the motorcycle's handling. Here, low speed control is crucial. Royal Enfield since the 30s has been winning a number of Trials events, both in the UK and other international countries, and over the years, garnered a reputation for its accomplishments. 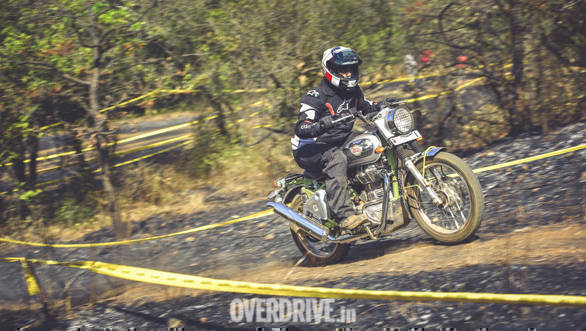 Cut to 2019 and Royal Enfield sought to build a near replica of its Trials motorcycles and that's why the Bullet Trials 350 and Bullet Trials 500. So what makes it different from the regular Bullet/Classic 350 and Bullet/Classic 500? Not a lot, actually. 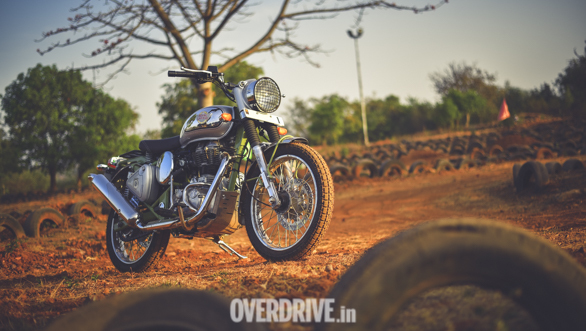 It is, let's say, a Bullet/Classic 350/500 that has been optimised for riding off road. So, the Trials' engine, chassis and suspension are identical to the Classic's. Even the seats and the riding position are the same. But, in order to make the Trials suited for off-road riding, they have 19-inch spoked wheels at the front and an 18-inch spoked wheel at the rear, shod with dual-purpose tyres. 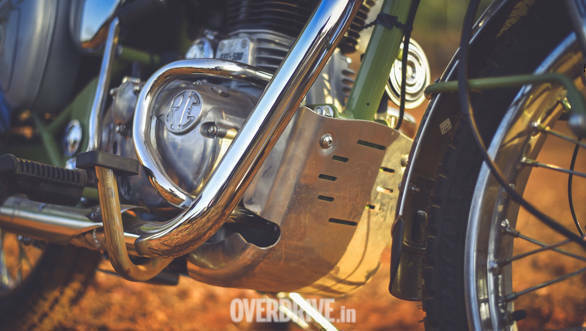 The handlebar is taken from the Bullet since its a tad taller, to make it easier to ride whilst standing on the pegs. The exhaust is also upswept and that meant chopping off the stay for pillion footpegs. In fact, there is no provision to seat a pillion as there is ...er..no seat for him/her. 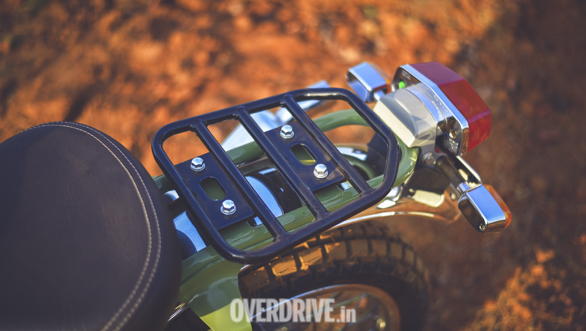 Instead, Royal Enfield has attached a luggage rack to carry belongings or whatever the rider deems necessary. Nevertheless, it's functional and focussed, and personally, it's something that I like about the motorcycle. In fact, it's the Trials' minimalist design that boosts its appeal. Firstly, it's the bright red (in case of the 350) and olive green (in case of the 500) frame that catches your eye. 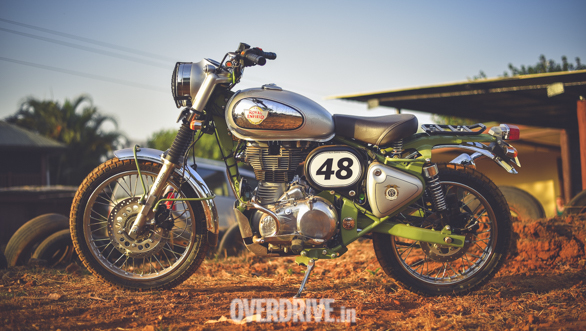 Royal Enfield could have gone ahead and used the conventional Black paint for the chassis. But, these colours stand out and how. Then there's the body panels, finished in contrasting paint work. On the whole, to me, the Trials bear a distinct character and is sure to stand out in a sea of Royal Enfields. The metal bash plate, headlamp guard and handlebar brace pad are all aftermarket fitments and I'd recommend you at least install the metal bash plate to ensure the oil sump is not susceptible to crack open in case a stray rock hits it. The seating position is upright and comfortable and it surely is designed to for spending long hours in the saddle. While riding off-road, it was easy to just sit and ride. But, while rididng over loose rocks and soft mud it became imperative to stand up and ride. And that's what exposes a minor issue. The thing is that the footpegs are so forward set that you end up grabbing the fuel tank, almost at its widest point and that will pose an issue for tall riders, considering that the handlebars are not set high, resulting in a hunched position. Also, a tank grip/ rubber pad would offer a much secure point to lock your knees on. 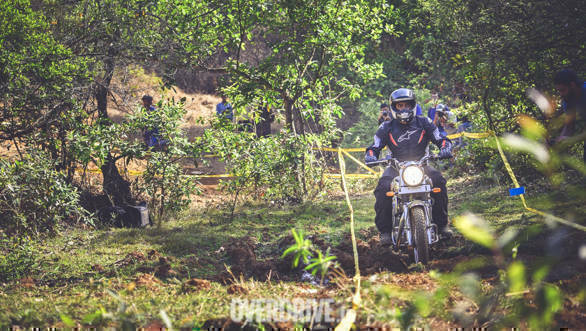 Royal Enfield set up a curated course for us to experience what it is like to ride a Trials motorcycle over natural terrain and, in a nutshell, it was interesting. The engines produce the same power and peak torque ( 350: 19.8PS at 5,250rpm/ 28Nm at 4,000rpm) and (500: 27.2PS at 5,250rpm / 41.3Nm at 4,000rpm). 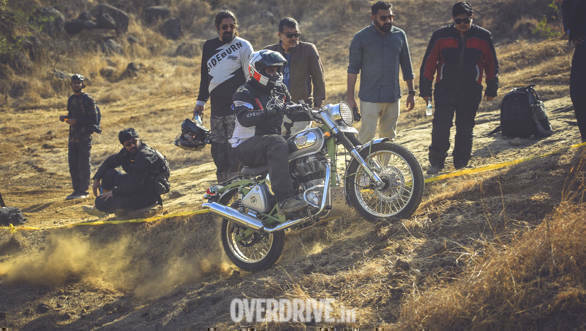 The company felt no need to alter the gearing as the engines have good bottom end torque and it was evident while riding up pebble and rock-strewn inclines. 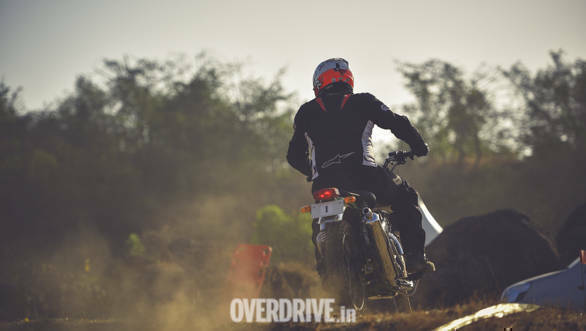 The Trials simply keeps chugging on and all you need to do is maintain a steady throttle position and the bike manages to ride over almost anything. The suspension, though unchanged, manages to absorb bumps well and that allows you to carry a fair clip over broken surfaces. I also have to say that the Ceat Progrips offer good traction while riding over loose mud and what have you. I only wish ABS was switchable as it would made it far more easier to control the bike on tricky surfaces. But don't expect the bike to tackle trails at speeds that you would normally manage on a proper adventure tourer. Like the Royal Enfield Himalayan. 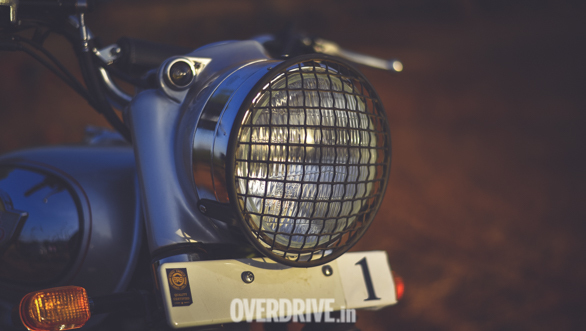 And that's what you need to keep in mind if you decide to purchase the Royal Enfield Trials. It doesn't have the comfort and suspension travel of a Himalayan. And it's heavy, so you don't want to ride on anything more serious than light trails. These are motorcycles that are designed for city and highway rides with some off-road trails thrown in the mix. Or maybe even the grand Ladakh trip you've been putting off. They are designed to take a pounding and will carry on even if you drop it. Like I ended up! 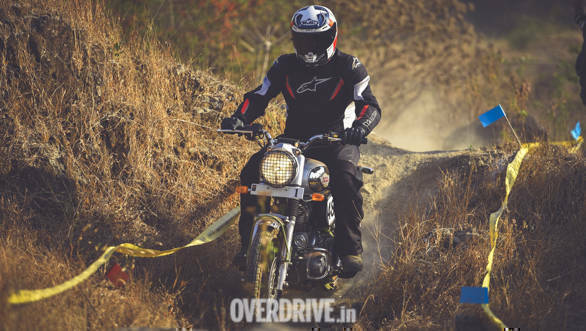 The Trials, then, is just a Bullet/Classic series motorcycle with better off-road ability, at Rs 1.62 lakh ex-showroom for the Bullet Trials 350 and Rs 2.07 lakh (ex-showroom) for the Bullet Trials 500. That said, the real appeal lies in the fact that you get a purposeful looking motorcycle that has a sense of individuality to it. Now that's something that always sets a motorcycle apart, doesn't it?